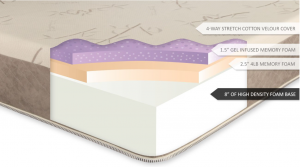 There are two 12" high models in the Memory Foam Mattress collection by DreamFoam Bedding, a marketing brand of Brooklyn Bedding: the Ultimate Dreams Aria Gel and the Ultimate Dreams Supreme Gel. They are very similar with an 8" base foam support core and two comfort layers of memory foam and gel-infused memory foam. They are also tight-top mattresses. The 8" support core consists of 1.8-lb. HD polyfoam. This undergirds the more conforming memory foam and the sleepers. The upper comfort layer is 1½" of 4-lb. gel memory foam. The gel enhances the memory foam's support. It also aids in cooling the mattress, along with the foam's open-cell configuration. 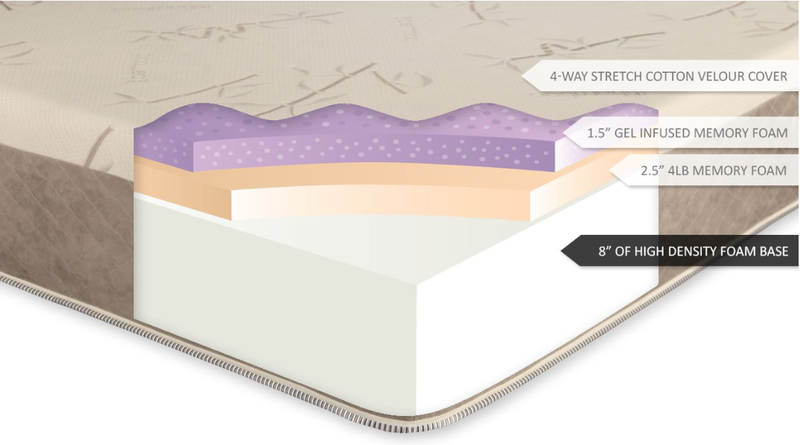 The second layer down is 2½" of open-cell memory foam. The memory foam's role is to conform to the sleeper's body contours to relieve pressure and to support the spine. It also islolates motion so that it is not transferred from one sleeper to the other, thereby minimizing partner disturbance. The two comfort layers together with the support core give this model a comfort level of Medium (5 on a 9-point scale). The tight-top cover is made of 4-way stretch knit cotton velour, intended to be breathable and absorb excess moisture. The stretch knit conforms the fabric to response of the foam. The Ultimate Dreams Supreme Gel is sold directly by DreamFoam Bedding and through Wayfair and Amazon (though it is listed as "by Brooklyn Bedding" on Wayfair and "by DreamFoam Bedding" on Amazon). The Ultimate Dreams Supreme Gel has a 45-day trial period. It is covered by a 1-year warranty from Brooklyn Bedding.